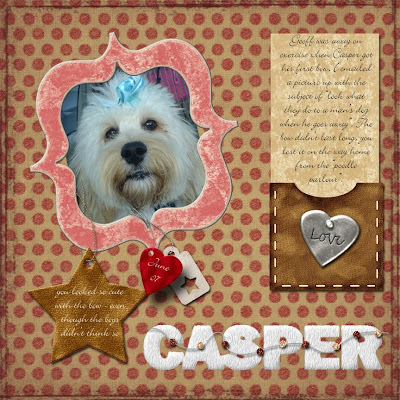 I did this layout of our fluffiest family member, our spoodle (spaniel / poodle cross). He is a total darling ! The photo was taken last year when he had been to what we call "the poodle parlour" for a clip. I picked him up with the kids and he had a bow in his fur. My son was most unimpressed - "boys don't have bows". My husband was away on exercise at the time so we sent an email with the title "look what they do to your dog when you go away for a few months". The bow didn't even last until we got home. The kit is Vicki's Cinnamon Toast - see blinkie on your right to get there. The title though I did myself to play with the fur action from atomic cupcake. My son and I made a yeti with it today using the paper dolls. I just love your LO! If only Noah would develop the same distaste for bows that your guys have - lately he has been obsessed with them ACK! Hmmm I should do a page on that just for you LOL! Vicki - feel free to post it on your blog. Casper is at the "poodle parlour" today being made beautiful LOL, will have to see what bow he comes home with.